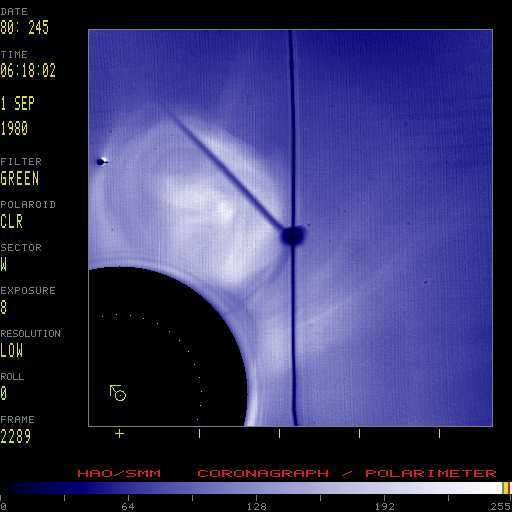 This coronal mass ejection is composed of a highly structed outer loop or arcade of loops and a complex `mushroom shaped' core. Solar north is toward the upper left as indicated by the arrow drawn into the occulting disk; the dotted circle marks the solar photosphere. Multiple, concentric loops/cavities with highly complex,multi-featured (prominence?) core superposed on streamer. Loop front is flattened. Streamer is blown out. Big deflections.